After your initial enquiry one of our friendly design team will contact you to discuss your playground and outdoor space requirements and arrange a consultation. During the consultation our playground designers will discuss your wishes in more detail, assess your current setting and how it is used. After a detailed site survey, the designer will present you with 3D visualisation and a detailed design. 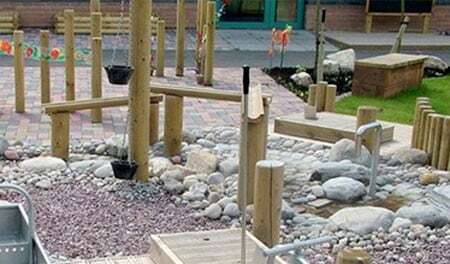 We work closely with you to achieve the best possible result for the playground. We are experienced in working in line with EYFS standards and Ofsted targets. Whatever the challenges the site presents, our team will come up with a unique solution for your playground. Together with the playground design, we will provide you with a detailed specification and quotation which will enable you to apportion costs and select individual play equipment if you wish to. You may also decide to complete the project in phases. All our play equipment and playground products are manufactured on site in our timber workshop. We have experienced wood craftsmen who produce the highest quality playground products and equipment and pay great attention to detail. We source FSC Timbers and use sustainable materials only. Our equipment is all safety tested and complies with BS EN 1176. Our experienced installation teams will install the playground causing the least disruption possible. They are all trained and certified and work to the highest standard you would expect. All work carried out by Timotay is designed to meet or exceed the Early Years Foundation Stage recommendation. We can provide you will all the necessary information you need for the maintenance of the play garden. All playgrounds and play equipment require ongoing maintenance, from regular grass cutting to annual assessing of play structures. We can help you to set up a maintenance programme that is appropriate for your playground and provide an on-site maintenance service to look after the playground. While our products and workmanship are guaranteed, all outdoor play areas are subject to wear and tear and therefore will need suitable care and maintenance. We have qualified play inspectors in our team who are able to ensure your playground complies with all necessary safety aspects.